By June 1944, the German Occupation weighs heavily on the Norman coastal village of Vergers. The Germans confiscate whatever food the villagers grow or catch, deport men of working age to their armaments factories, and delight in summary executions. One person they shoot is Ezra Kuchen, the baker; the villager who takes his death the hardest is his assistant, Emmanuelle, known as Emma. Emma would never dream of joining the Resistance, whose activity she blames for other losses, and who believes the Allies will never invade, so what’s the point? But willy-nilly, Emma becomes the prime mover in a complicated barter arrangement whose weblike strands encompass the whole village, and which the Germans would certainly call resistance. Her treason centers around baking bread for the occupiers, which she cuts with enough straw to make extra loaves for neighbors in need. In each loaf, she carves a subtle V.
Each morning required every gram of Emma’s skills, all of her artifice, to bake loaves containing straw and have neither the Kommandant nor his officers notice. Yet this was only one of five hundred deceits, all conceived during the long strain of the occupation. She learned to sow a minefield and reap eggs. She could wander the hedgerows pulling a rickety cart, and the result would be maps. She could turn cheese into gasoline, a light bulb into tobacco, fuel into fish. She could catch, butcher, and divide among the villagers a pig that later every person who had tasted it would insist had never existed. I like this part of the novel the best, and not only because of Emma’s ingenuity. Every fiber of her duplicity exists to satisfy someone else’s wants, which she at first resents, because they leave no room for her own. But over time, she realizes that throwing herself into feeding others gives her a reason to live despite her pessimism, and keeps her from dwelling on her repressed desires, which would drive her mad. When someone tells her to have hope, she snaps, “Can that be eaten? What does it taste like?” But since the novel opens on June 5, 1944, the reader knows what’s coming before she does. Having written about military occupations and traveled Normandy, I was looking forward to The Baker’s Secret. (My fondest memory of the many French walking trails I’ve followed is of Calvados, where a group of local hikers pressed wine and food on me and told me how grateful they felt to Americans for having liberated them.) I gobbled up this confection of a novel in just about one sitting, which says something about its excellent pacing, but I felt hungry soon afterward. The story pleases, but, except for Emma, the characters have no depth, and the fable-like tone makes it hard to tell whether to take the narrative’s real tragedies seriously. 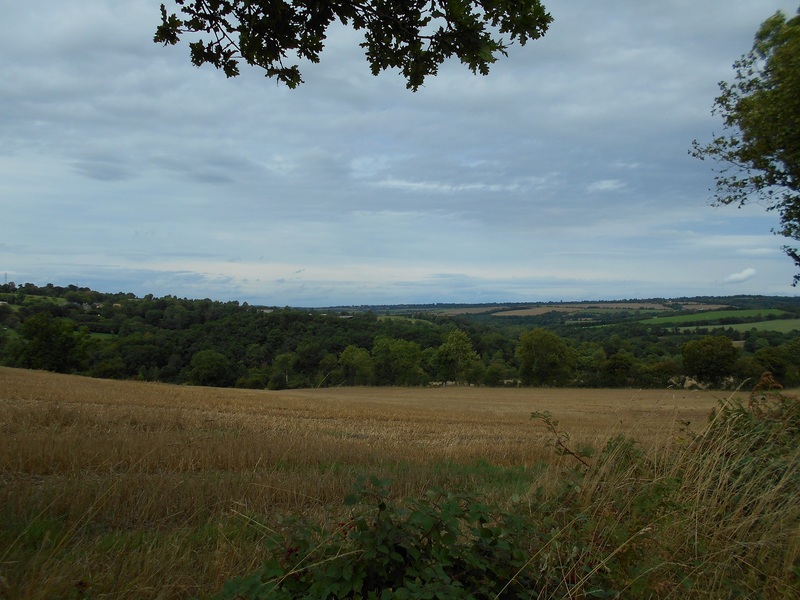 I took this photo in 2015, near the Norman village of Thury-Harcourt, an area that saw heavy fighting several weeks after the invasion. One weak link is the German soldiery. Unlike the case with All the Light We Cannot See, to which this book will inevitably (and wrongly) be compared, Kiernan’s occupiers deal out plenty of brutality. But they’re stiff, utterly predictable marionettes who act like no soldiers I’ve ever read of or seen, let alone like the Wehrmacht. They are easily fooled, spout racial and political prejudices like windup toys, seem not to understand their own weaponry, and even invite Emma to a place where she can see their fortifications, which they then boast of to her. They’re not buffoons, exactly; more like a collection of bumbling neurotics with guns. Just as the Germans are unreal enemies, the villagers are improbable, idealized good guys. They’re more like a foreigner’s idea of what French people must be like, with generic, styled modes of expression, attitudes, and descriptions. Further, I don’t believe that Vergers has a Jewish baker, that Ezra Kuchen is Jewish, or that the villagers would honor him in death so fervently. He’s a cliché, a blatant device, and, incidentally, the only villager to possess a last name, whose meaning (“cake”) is no subtler than anything else in this story. Kiernan tries hard to evoke Emma’s fear that someone in Vergers will betray her, but you know they won’t; they’re too righteous. Over time, a candidate presents himself, but he’s so roundly detested that you expect his duplicity rather than fear it. I appreciate Kiernan’s attempt to show the cruelties perpetrated during the Occupation, and to portray the violence of the invasion as a decidedly mixed blessing for the people of Normandy. But The Baker’s Secret, though it has its poignant moments, teeters between cartoonish fable and skewed reality, and leaves me unsatisfied.